Here are a few fun facts for ya. You can get really expensive hotels for ridiculously low prices (USA only) by bidding on priceline. Seriously. We stayed at a fay-an-cee Hilton in Houston for only $60 per night (regular price $179) - which is about the same price as staying at the Super 8! Over the course of four nights in hotels, we have saved a good $400. Or you could look at it this way - we've spent no more than we were willing to spend but got to stay in a bunch of 4 star hotels. There are two main differences between cheap hotels and fancy ones. First - space. In fancy hotels you actually have room to walk around the bed. Second - service. In cheap hotels, if the front desk staff are feeling lazy, they will just tell you, "no, we don't have extra pillows here." Good service costs. At least in America. The good people who help out with a friendly smile are working hard to earn their tips. One of the most fascinating things we've done so far is to go on a Katrina tour. It is heartbreaking to see the number of abandoned houses that are just sitting there and falling apart. Many homes still bear the "Katrina tattoo," which is a spray painted "X" with letter and numbers in each of the 4 sections. The letters show who checked the house (NS - National Security, NOPD - New Orleans Police Department, etc. ); some numbers indicate the date; other numbers the number of people found; and still other numbers to show how many were alive and how many dead. Another devastating fact was to learn that the government has spent millions (or was it billions) on repairing certain things in the city - such as City Park, while neglecting to do anything to repair and restore a single one of the hospitals that was shut down by Katrina's damage. In our tour alone we saw three massive hospitals, all completely abandoned and vacant. On another note, have you ever seen a 26 mile long bridge? We drove on one between Baton Rouge and New Orleans. Wild, eh?! It's all swamp, so the only way to get people across it is for them to go over it. And to complete the blog post of all sorts of things you never knew and many you never wanted to know... I would like to offer a public service announcement to all those considering eating nothing but rich, fried food for a week - this is a bad idea! You digestive system will never forgive you. Neither will your pants. This handy little blogger term is used when you get to meet someone face-to-face whom you've only known through blogging/ email/ etc. But there was an event this week that had me even more excited than Beth... After more than a year of correspondence via email, I had the opportunity to meet my dear blog friend (and book editor), Bobbie! Not only did we meet and hang out a bit, she and her hubby (and their dog) opened up their home to us. They took yesterday off work to play tour guide (read: that's why I was way too busy to blog yesterday). And they have been feeding us some of the most delicious, most fattening, most amazing food known to man! My friend Bobbie (who blogs at 40 Shades of Pink) ran across a fun idea for Saturday mornings, inspired by the Nie and You blog. Okay, I confess, we completely stole the idea! The Small Villages of Haiti Need our Help! As Haiti is hit by numerous aftershocks and people give generously to the relief effort, another tragedy is happening in their country - the small communities throughout Haiti are not being reached by this generosity! The relief effort is solely focused in Port-Au-Prince, and smaller communities have been levelled and are running short on supplies. If your heart is to assist in these neglected areas of Haiti, I would encourage you to give generously to Haiti Arise Ministries. They are situated in Grand Goave, which is a slightly larger small community situated in the middle of many little villages. Haiti Arise WILL focus their aid in these areas. They have already been offering care to many people from those areas. And just as with the Red Cross and many other well-known charitable organizations, Haiti Arise is eligible for the grant from the Canadian government - where every dollar Canadians donate is matched. Please continue to pour out your love on the people of Haiti by both praying and donating. As I ready myself this morning for my first speaking engagement on mother anger, my heart is filled with prayers. I have sometimes heard - even been one of those who has said - when we are not walking in God's will for our lives, our ears become deaf to His voice. Somewhere, in the recesses of my mind, I have believed that God will not heed my prayers if I am knowingly in sin. In the silent hour of this dark morning, though, I felt His presence. And far, far away from His will is where I have been. If our children are rebellious and disobedient, but they come to ask us for food, for a hug, to talk a minute - do we cross our arms and turn away, pretending as though we cannot hear their pleas? Of course not! If our love for our own children is too great to ignore them when they come to us, don't we know that our Father's love for us is that much greater? For some weeks now - in spite of knowing the call on my life to commit each day to the Lord through prayer and praise, the reading of the Word, and listening for His voice - I have neglected my time of communion with Him. If His will for me is to spend time each morning in His presence, not doing so means that I am walking in sin. And yet, even in my sin, I hear His voice. Without a thought of repentance, continuing in my sin, I cry out to Him in prayer and sense His presence. Though I have wandered, He comes with me. What a precious gift to find that I was wrong all along! Humbled by His love and grace, my heart is turned. An extra hour of sleep no longer holds more appeal than communing with the God who loves me, hears me, and answers me - no matter how far I wander. First cuppa coffee, email, bedhead... 7:22am. Nothing I have to say is nearly as good as this post about by Mama Bird or this post by Kingdom Mama. Wow. Chances are my day will be spent in a battle between productivity and reading all the posts linked up to Bold Blogging. Here they are, all bundled up for an hour in the winter chill. It was actually a fairly mild January day - only -9C (15F). Good ol' Royal Bank of Canada, sponsors of the 2010 Olympics. These guys were handing out flags and pumping up the crowd. An Olympic bus. Guess they needed to add a couple vehicles to make the parade longer. Of course, Coca Cola is sponsoring the Olympics! And all the athletes will drink Coke for commercials, while secretly thinking that we all know Pepsi is better. Ooooh, look! Off in the distance. People running! Right in front of us. Wooohooo!!!! Overall, I found it pretty anticlimactic. 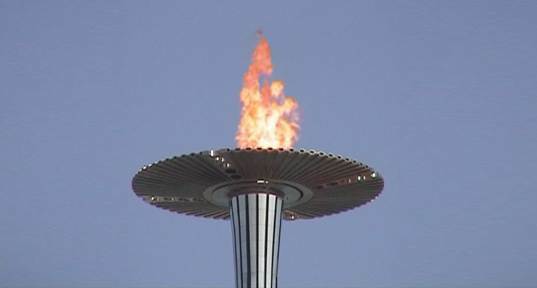 Especially since the torch looked a lot more like a rolled up tube of paper on fire than the torch I was expecting. But the kids seemed impressed. The only thing they weren't impressed with was that I dropped them back off at school. 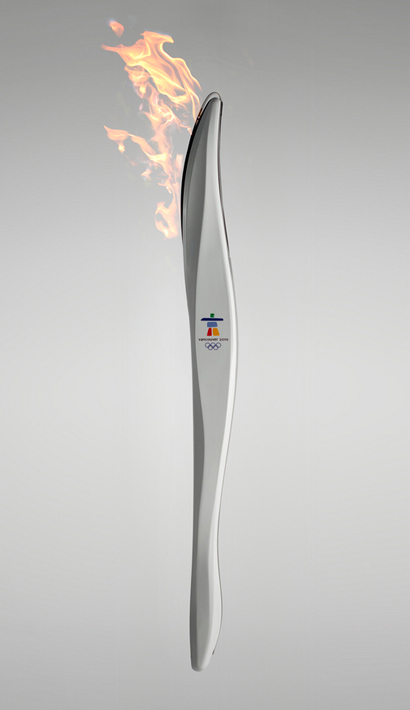 For those interested, THIS is what the 2010 torch looks like up close. THIS is what I was expecting to see. It's difficult to think of anything to write when my heart is so burdened for the people of Haiti. Since Pat went there in October, our hearts have been turned toward these people and this nation. As soon as we heard of the earthquake, our thoughts rushed to the many friends Pat has there and the mission that we support - Haiti Arise Ministries. I say there is no hope, yet I do have hope. Our God is the God of hope and restoration, and though the streets and buildings may never be the same, our God is right there in Haiti right now, calling the people to be restored to HIM. The story goes something like this... A hundred years ago (or maybe two?) the political leaders of Haiti made a deal with the devil. They wanted wealth and success for themselves, and in exchange for this they turned over their nation to the hands of satan. So for those years, while corrupt leaders grew fat and rich, an entire nation was covered in darkness. Disease, starvation, voodoo, satanic rituals, garbage, filth, poverty, and child slavery ruled. But now, that deal with the devil has come to an end. His time is up. And the spiritual battle for the hearts of the Haitian people is raging. Please join us in praying for the Haitian people. Yes - pray for their health, safety, healing, rebuilding. But more importantly - pray for them to seek and see the face of God! Pray for them to turn from voodoo and run into the arms of Christ, spread wide on the cross for their salvation. Pray that the people who come to help in this tragedy are a light for the people of Haiti. Because with Christ, nothing is as hopeless as it seems. Megan is an eighty-year-old woman in a six-year-old's body. I know this, because only old women talk like she does. Last night, as we drove home, she opened her window. It was +12C - unseasonably warm for January in Alberta. Enjoying the warm breeze on her face, Megan leaned her head back and sighed. "Mom," she said, "This warm weather is so fabulous! Tomorrow, after school, we should all go for a nice walk. Wouldn't that be lovely?" Somebody at our house is VERY enamoured with his Papa. Kai tends to give everyone who enters the door a thrilled greeting, but he saves his loudest and most excited for Papa. Not long ago I had all the kids at the eye doctor. Mr. Kai asked for my phone, "'Lo? 'Lo?" (He knows that playing with his Mommy's 'Hello' is something that he needs to ask for with his sweetest voice and smile. Because nothing was more important to me than him being good in the waiting room, I hit the lock button and handed it over. He chattered and babbled into that phone for a few minutes, then came and handed it to me. (As if to say, "Here Mom, it's for you.") I played along and talked to the imaginary person on the other end. Eventually, I told him it was for him. He grinned and chatted some more. I began asking who he was talking to. "Is it Daddy?" He shook his head no. "Is it Abbey?" He shook his head again and pointed at Abbey across the waiting room. (Duh, Mom, she's right here.) "Is it Grandma?" - this one has been the sure answer with four other children. My muscles are beginning to hurt. You know that distant uncomfortable feeling - the one that provides fair warning that in approximately 24 hours you won't be able to walk down your stairs or sit on the toilet without crying out in pain? But it's good! Over the course of an hour, the sensei somehow managed to trick us into working up a good sweat, doing about 50 push ups (in my case, not with the prettiest form), doing a good 100 crunches, and more. I forgot how good it feels to hurt like that. The best part, though, was watching my Muffin-girl. She was so intent, so focused, and totally awesome! She loved every minute of it and participated for the entire hour. At the end of the class the sensei handed out forms to order a uniform (it's called a Gii - no idea on the correct spelling of Japanese words). Meg looked at me with a light in her eyes that I haven't seen in a while and proclaimed, "I want one!" I love my kids, but I am not so great at showing love to them. Love is patient - I tend to be impatient. Love is kind - I wouldn't say that I'm unkind, but I also can't say that I go out of my way to do nice things for them. Love is not easily angered - but I am all-too-often easily angered. For the months of January and February, as part of my project with God, I have decided to focus on showing love to my kids. I am going to pay attention and take notes about their likes and dislikes, their personalities and love languages, as well as make note of situations where I am not kind, patient, or loving and figure out how to do it differently next time. For so long I've just prayed, "Lord, please help me not to blow up," and hoped that one day I would miraculously be delivered from this struggle with anger. But with the help of a children's song I am learning that I need to counteract my anger. Counter-Act. Act in the opposite. So rather than waiting for change to just happen to me (and in me), I am going to begin living as if I've been changed - doing the opposite of what I'd normally do. I will counter-act the anger that so often bursts from within with love. And on this great, big, huge, massive project I will be one teeny-tiny step closer to the consecrated life. 1. Am I the only one who still has my Christmas tree and decorations out? I have thought to myself daily since December 30th, "Self, you should really get that tree down and all the decorations put away." But the lazy in me keeps winning out. 2. How many cups of coffee do you drink in the morning? Three cups is about perfect for me. If I only have one I end up with a headache, but if I have four my tummy starts to feel that "icky" feeling. 3. What time do you put your kids to bed? And what time do they get up? I am fairly strict about our 7pm bedtime on school nights. Those who don't actually need as much nighttime sleep (anyone who napped) will wake up as early as 6am. The school kids are dragged out of bed at 6:45 - in order to catch the bus at 7:45. 4. Do you floss your teeth regularly? I never have. I would say that I floss about once per month, and once per week for the month prior to a dentist visit. I know, pathetic. 5. If you were stranded on a desert island and could only keep the pages from one book of the Bible, which book would you keep? And why? I'd have to say James. Every time I read it I find something practical and relevant. Love it! You know, I kinda had a 'plan' in my head for how this consecrating stuff would go. I figured that God would nudge me on the 'small' things first (you know, maybe He'd call me to stop using curse words), and by later in the year (maybe next fall) we'd have worked our way to some 'big' things (such as anger). Has anyone else noticed that God always seems to have plans of His own? Friday evening Pat and I went on a date. Our dinner conversation revolved around the kids and our parenting methods. We're finding that the honeymoon phase is over, and they're all showing signs of stress from all the life change. When children are experiencing stress in their lives that they don't understand and can't really verbalize, they blow off steam the only way they know how - acting out (or is it acting up?). Our two weeks of school holidays have been filled with bickering and tears (both theirs and mine), time outs (again, for them and me), and an overall sense of frustration. Sunday's sermon was all about parenting - how to pass on a legacy of loving God. One of the things he mentioned was that our actions will influence the way our kids see God and think about Him. He also spoke about trying times as a parent, and how we can get so caught up in trying to 'fix' whatever is going on with our kids that we fail to ask ourselves the most important question, "What is God trying to teach me about myself in this moment?" Oh, and to top off all those little hints coming my way, I've had a sick child for three days (we're onto day 4 now). Which means there is a Mommy in this house who is VERY short on sleep (read: short on temper) and a boy-child in this house who is surely dying (read: big, whiny baby...just like a male; also read: trying Mommy's patience in a big way). So right out of the gate I'm getting some practical experience moments. I'd have to say that, so far, I'm at about a 50/50 pass/fail rate. Sometimes I wonder why I keep on asking God to do the radical in my life! I mean, I'd really be okay if He just did the semi-radical. I'd still grow, I'd still change, it would be good. And not so dang hard! Yet there's this drive in me that cannot be content to settle for 'good enough.' I don't want to be a good enough mom or a good enough Christian. I want to be the best I can be. I want my kids to see my active pursuit of righteousness and desire that same thing in their lives. I want the world to see me and say, "Wow, that Tyler girl sure does love her Jesus!" I want GREAT; good enough simply won't do. I spent the year of 2009 learning God's ways and His paths. Though I could literally pursue that theme for the next several years of my life, I felt the need to find a new theme for the new year. I thus declare the year of 2010 "the year of consecration." because I am the LORD your God. I found this verse, and it resonated so strongly that I could not ignore its call. I thought it might have something to do with being "better" than I am (and who doesn't want that), but I couldn't fully commit to consecrating myself without understanding the full meaning of the word. As God's children, He has already set us apart for His high purposes. But all too often we sit there in the knowledge of being set apart without living in the reality and the solemnity of the consecrated life. We talk like the rest of the world, we act like the rest of the world, we look like the rest of the world - there is nothing different enough about us that makes us stand out. When I say "us" I actually mean "me," but it just makes me feel better about it to think that there are others out there like me. This year, there will be no grandiose resolutions for me. I will not commit to losing 30 lbs (though I should); I will not promise to never say another curse word; I will not swear off yelling at my children or being crabby with my husband; I will not promise to "never do this/change that forever/be who I want to be and not am." I can't. Because the pursuit of holiness isn't something I can just DO. In 2010, I will, however, commit to the relentless pursuit of holiness - one aspect of my life at a time. I will trust in God to show me what He wants to work on in me, and then I will not only let Him do the work, but I will actively participate and cooperate with what He wants to do. And one bit of my not-so-set-apart life at a time, I will commit to allowing Him to consecrate me. Because if there's anything I want in this life, it's that I will look different, sound different, and BE different...set apart for His high purpose.